Moms on Money: How Much Should I Be Saving For Retirement? Although we’re far from retirement age, I still wonder: how do you determine how much money you need for retirement? Right now we contribute to our 401Ks (which took a beating in 2008 in a way that will make me rock in the corner if I think about it too long) but we’re primarily saving for our kids’ college right now. Once they go we’ll be able to save more toward retirement, but will that be enough time to avoid working until we’re 90? How do we know how much we need to safe up for retirement? Today we’re featuring answers from Done by Forty, Save.Spend.Splurge., Barbara Friedberg, and Joe Saul-Sehy. To see what they said head on over to More than Mommies! If you’re a PF blogger and have some input, we’d love to see it in the comments section over there! 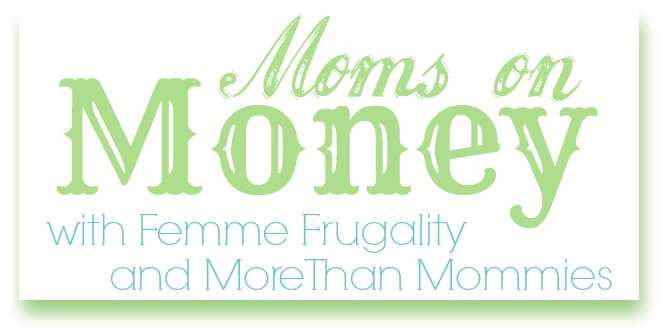 This entry was posted in Family Finance, Money Management on March 20, 2014 by femmefrugality. Another really informative piece! Thank you SO much for doing this for us. I know a lot of hard work goes into putting it together, so I wanted to let you know it is appreciated! Oh, thank you guys so much for hosting! You put a lot of work in, too! Looking forward to the next one! Please, please, PLEASE do not hold off too much on investing for your retirement thinking that you’ll make up for lost time once the kids are in college. You can NOT beat compound interest. You’ve got to make your retirement a higher priority than your kids’ college education. I know this doesn’t set well with a lot of parents. It didn’t set well with me – but we put $ aside for both our kids’ education and our retirement and I am soooooooooooooo grateful that we did. When you save “too much” for your children’s education, you tend to spoil them a tad too much while they’re in college (speaking from experience here) and once they’re out of college and (hopefully) on their own, you’re now looking seriously at how much you’ve saved for your retirement and how long you have to catch up – and guess what, you’re actually WAY more tired at that point in your life than you ever imagined. You share the opinion of the panelists! Doing both if you can seems to be the general consensus, but prioritizing retirement savings. Thanks so much for your input!!! !